Stephen Cummings has made his mark as a musicians’ musician. He has turned out a fantastic string of albums over a number of decades, each one recorded with a core of musician friends who possess the same savvy. He brings wit and understated excellence to every performance. 2014 sees Stephen release his first album for three years, ‘Nothing to be frightened of’ which was recorded and mixed by Shane O’Mara in two days. ‘Nothing to be frightened of’ is a lucid commentary on humanity's inevitable confrontation with loss and death. It has chutzpah, a seismic beat and a refusal to knuckle under to the idea that one has less time than one imagined. Cummings is everywhere and nowhere. In addition to his solo release, two original albums of his former group, The Sports, are to be released by Warners this year with 50 additional songs. Curiously enough, Cummings didn’t perform The Sports songs for twenty-five years. Instead he recorded twenty solo albums. 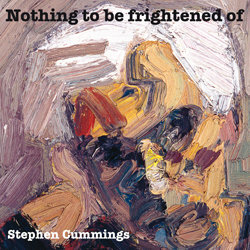 Stephen will be touring Australia nationally in September to launch ‘Nothing to be frightened of’.